As a new teacher learning to teach students to write, I found fallacies a relief. With fallacies, I could teach students concepts with certainty. With fallacies, students could see that rhetoric has concrete ideas like math or science. With fallacies, we could work on numbered problems with right and wrong answers. Yet I’ve come to believe that this kind of thinking about fallacies does explore key rhetorical facets of fallacies. 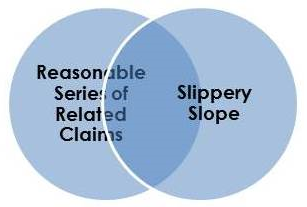 Fallacies are not as clear-cut as the current practice of spotting them might suggest. Instead, they rely on the rhetorical situation. Just as it is an argument to create a fallacy, it is an argument to name a fallacy. In this post, I present a new way of teaching fallacies. My article in Composition Forum "From Logic to Rhetoric: A Contextualized Pedagogy for Fallacies" offers a justification of these methods and a critique of current textbook instruction as a-rhetorical. The forms of reasoning typically named “fallacies” are not objectively illogical or incorrect regardless of content or context. Even current research in logic aligns fallacies with rhetoric more than logic, suggesting that “‘fallacies’ are no longer fallacies” at all (Walton, Reed, Macagno Argumentation Schemes 3). What textbooks often call “logical fallacies” eventually became “informal fallacies” to differentiate them from hardline problems in syllogisms, and “informal fallacies” have for some critics become “rhetorical fallacies” or “defeasible reasoning” to reclassify them as problems not in logic, but in persuasion. In rhetorical terms, fallacies are situated and contextual rather than universal. I embrace rhetorical fallacy as my term because rhetorical emphasizes the crucial audience component while fallacy, a term used widely across disciplines and discourses, contains in its very history a crucial shift from objectivity to argument that underlies modern rhetorical thought. I propose that instructors treat fallacies as part of rhetoric by providing a definition based on current research suggesting that fallacies are not formal errors; by demonstrating that fallacies correspond with successful rhetorical strategies; and by showing that to name a fallacy is to make an argument, opening room for disagreement. To improve the teaching of fallacies, I turn to devices long taught with success in English—appeals, figures, evidence, all types of rhetorical strategies. If teachers were to think of fallacies as linked to rhetorical strategies, as part of writing methodologies, as devices to be interpreted, even written about, then they become not just something to spot and name but something to explore and explain. When a politician talks about “job creators,” my students argue that Republicans might see this as strong diction, but Democrats would likely see it as doublespeak, one pair of rhetorically successful strategies and failed fallacies. 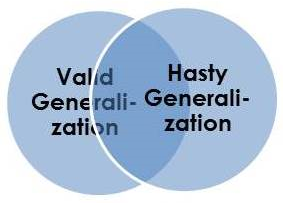 In others, hasty generalization is a subset of generalizing; red herring is a subset of exploring related issues; and ad populum is a subset of appealing to common values. Each rhetorical strategy that can fail can also succeed, and because of the dependence on the rhetorical situation, what one might consider fallacy, another might call persuasion. To complement this comparative goal, I propose the organizing mechanism of the Venn diagram, in which success and failure overlap. Both circles of the diagram present the same strategy, but the categories elicit different audience responses, so they differ in effect, not form. This presentation uses a logical diagram, the Venn, in a distinctly non-logical but highly rhetorical way. 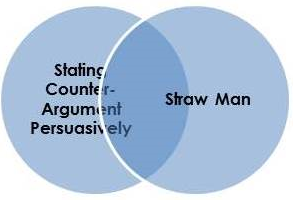 Each rhetorical strategy encompasses a persuasive circle—noted by adjectives that describe the strategy as strong, useful, convincing, etc.—and an unpersuasive circle, named with fallacy terms. 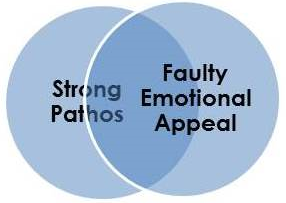 The overlapping space of the Venn opens multiple positions, demonstrating that claims might succeed and fail depending on rhetorical context. It even allows the option of a claim being somewhat convincing, having characteristics of both fallacy and success for the same audience. At the outer edge of success stand rhetorical claims that might persuade all members of the audience: a speech given to like-minded people as when a preacher strikes a powerful chord with parishioners. At the other edge of failure might be a speaker talking to an inhospitable audience, perhaps a guard in a prison. The statement might even fail for the guard but is a requirement of the job—elucidating self-persuasion, the self-as-audience that Kenneth Burke discusses in Language as Symbolic Action (301). Such a rhetorical act would be a complete failure. Wholly successful or wholly failed rhetoric does not mean perfect or defective for all possible audiences—an unachievable universality—it means success or failure for the audiences reached. Which strategies are most likely to succeed depend on the values of the audience and the standards of evidence within a specific context. My list, then, does not privilege certain rhetorical moves like providing facts or citing science over other evidence. Statistical methods appear alongside stylistic figures, emotional appeals, definition from stasis theory, and qualifiers from Toulmin logic. In this way, logic becomes a rhetorical consideration among many elements in discourse. Incorporating audience into definitions of fallacies can allow teachers to demonstrate key features of audience. They can show that audiences add to the meaning of the text with their own knowledge, a process that is crucial to interpretation. They can also show that even when individuals identify with the same community, those communities do not interpret monolithically. When reenvisioned in the way I propose, fallacies can complement instruction on rhetoric as epistemic, that is, stressing language as the basis of knowledge and privileging argumentation as the means of knowing. I don't use this game much anymore because it doesn't promote the complex thinking about fallacies that I spend time cultivating now; however, the game does engage students in a fun way. Moreover, students could identify the overlapping pair of successful strategy and rhetorical fallacy instead of simply the fallacy term. Each of these examples tends to skew toward the fallacy category though.